I'm a newbie, but I found her approach to be quite novel. Rather than rolling out dough, her method uses high hydration "batter" that she pours out on a silicone lined 1/2 sheet baking pan. Bakes for 10 minutes and then removes to score (with a pastry wheel) and then returns to the oven. She also uses a "turn the oven off, but leave them in for 30 minutes" approach. She has a book, available in paperback or Kindle, which I *highly* recommend. She has some great time saving "subcomponent" (my word) recipes for a "Super Seed Mix" and a "Whole Grain Mix". She also has three videos on YouTube where you can see how beautiful her crackers are. Also a few examples on Flickr. The grains you can use in her recipes goes waaaaaay beyond just wheat. I'm planning on trying her method this weekend, but I have no doubt that it will work. As she says, "It's not rocket science". Never having store bought bread in the house but getting a box of crackers has never felt right me. I keep promising myself to look into a method that produces a nice cracker. This is a good motivator. Thank you for the link. One of the things I dislike doing is rolling dough out thin. That has been a major psychological barrier to me for making crackers. I will have to look up her book and watch the other video (I omly watched one and I'm captivated) . 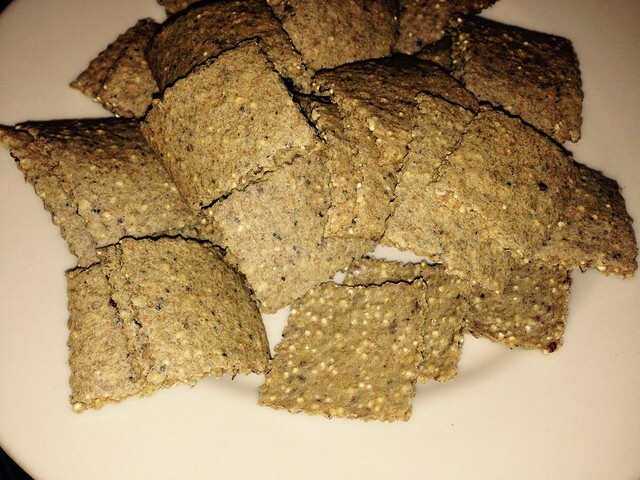 I made multi seeded crackers last night and was ready to give up making them, (again). I can never get them thin enough. I will get this book and watch the videos today! This will probably be another of those "why didn't I think of that" moment. Again and again all the wonderful people here on Fresh Loaf have helped me be a better bread maker, and now, a better cracker maker. Thanks so much! Moreover, for those who are inclined to do some home milling (especially playing with seldom used coarser settings), I think this idea presents lots of options for experimentation with some rather odd flours, beans and rice combinations that are FAST to mill and cheap to try. Some of these experiments are likely to prove be pretty iffy if not downright dreadful, but some != all. There are likely to be some amazing crackers awaiting discovery. First batch of whole grain crackers... pretty darn good! First batch of whole grain crackers turned out pretty well! Using the wholegrainalice.com method. My recipe was to mill 1/4 cup of buckwheat and 3/8 cup of hard red spring wheat berries for the flour. Add an egg, 1/4 tsp of salt, 1/4 tsp of black pepper, 1/4 tsp of oregano and 1/4 tsp of some French Fry Seasoning (which contains salt, dehydrated garlic and onion, black pepper and paprika), 1/4 cup of whole grain mix (quinoa, amaranth, millet, and polenta) and a Tbsp. 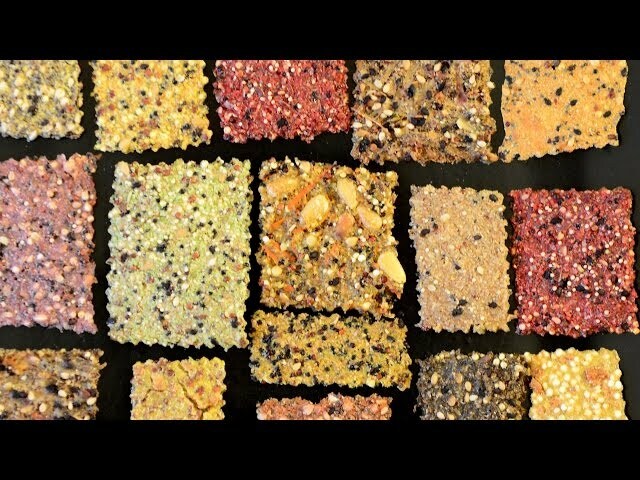 of seed mix (equal parts Poppe Seeds, Flax Seeds, and Sesame Seeds). Added water until I had a nice batter consistency. Pretty good by themselves and delicious with some Pepper Jack cheese. Now that I have a big container of the Whole Grain mix and Seed mix it will take about 5 minutes to whip up the next batch and throw it in the oven. I'd urge everyone to give it a try! One postscript: Alice says to use the buckwheat in the Whole Grain Mix, but I thought the buckwheat looked larger than I wanted, so I decided to mill it with the wheat berries into the flour. That worked well. Very curious to try other kinds of flour (and additives to the flour). This is great fun for the experimenter! ....and thanks for the link. This is an interesting technique. I remember a recipe for Melba Toast from one of Maida Heatter's books that used quite the same idea: a very wet dough, spread in the pan by tilting it about, and a long baking to dry out & crisp the crackers. Scoring them when wet is a new twist, however. Because there is little sadder than a soft crackers, or scorching the thin ones to get the thicker ones fully crisped, I suggest an additional step: after all the crackers are done, pile them loosely on a baking sheet(s), and return to the oven set to about 225 degrees F. Let them bake for 30-60 minutes, and sit in the oven while it cools down (since I bake most often in the evenings, I usually turn the oven off and go to bed, and take them out the next morning). The long low heat dries and crisps without the risk of scorching. I adapted this trick from biscotti, which use it to such great effect. Anyway, I'll be checking out Alice's book, because I love crackers, and still buy far too many of them: even though they're not that hard to make, they're so good when homemade and pair so well with cheese and soup and dips that they don't last long. I'm not sure yet if her technique is easier than what I put together in my own Cracker Primer, but it definitely looks worth investigating. Thanks for the link to Alice! I'd been frustrated by making crackers for a long time. They always came out too thick, or not quite right. My next trick was going to be to roll the dough through the pasta maker, but then I thought to see what the Fresh Loafers were doing. Alice's recipe is brilliant! I made two batches, using home ground flour. The first was a combination with red fife wheat and rolled oats. The other I mixed in some kamut. Both were good. Different seeds in each. I found the first batch a little thin, so the next time I made sure the batter was a little bit stiffer so it covered the sheet without running. I also used parchment paper, since I didn't have a silpat. They were both great initially, but staled a bit for the second day. I may have left them out a bit on the night we used them. Thanks to the introduction to this method....I'll be using it again! "My next trick was going to be to roll the dough through the pasta maker"